One thing that everyone should know about me is that I love love love Mexican food. Seriously, just ask one of my friends. Our favorite cure for a bad day is to hit up our favorite Mexican joint to talk over a bowl of queso dip. As a result of this love, I have put more effort into trying more Mexican recipes. One of the first I mastered was a fairly simple chicken enchiladas recipe that I still love to share and it was the perfect choice for dinner when I had my dad over last week. The first step is cooking the chicken. After preheating the oven to 375 degrees, I start with a pound of good organic chicken thighs (from Costco of all places) and rinse them off. I then like to rub taco seasoning onto them to add a little extra flavor, but I didn’t have any on hand this time so I used Old Bay instead. It turned out quite tasty so use whatever you happen to have in your spice cabinet. Lay the seasoned thighs in a baking dish and fill it up with water until there is about half an inch in the dish. Then bake for about 30-40 minutes. After they’ve cooled, shred the meat and you’re ready to start the sauce. Start the sauce by sauteing the onion and garlic over in a large oiled skillet over medium heat for about 4 minutes until cooked. Then add the green chilies, the shredded chicken, and most of the enchilada sauce (saving about half a can for later) and cook for 2-3 minutes. Fold in most of the cheese, again saving some for later, and remove from heat. 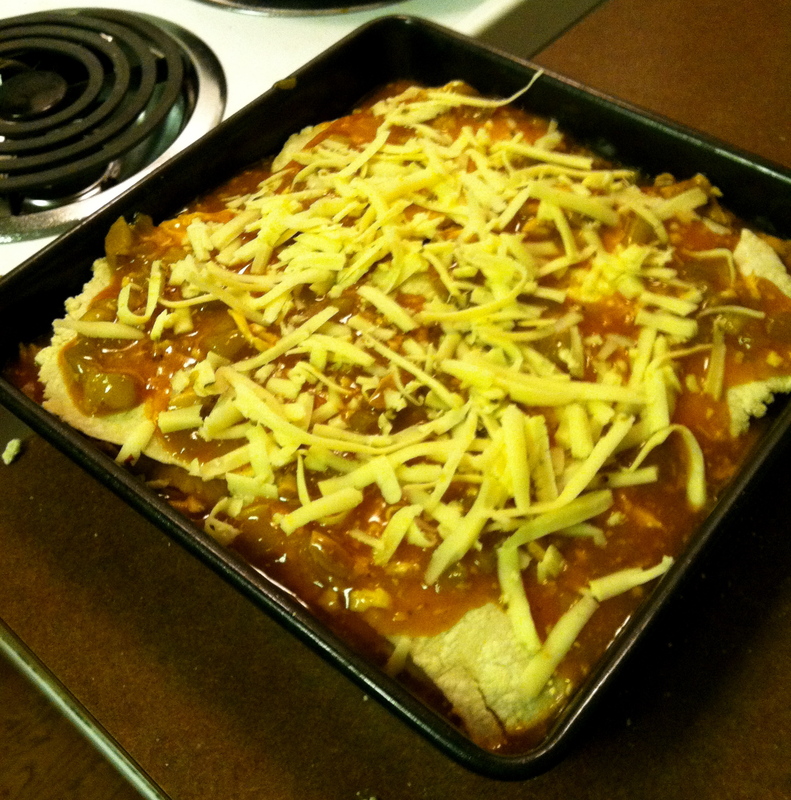 Now, I believe that the secret to making excellent enchiladas is all in the tortillas. I had a life changing experience a little over a year ago at the Outer Banks when I first tried Green House Tacos. There’s a Mexican family that lives in this little green house that sells tacos out of their kitchen made with fresh meat and herbs and toppings straight out of their garden. But the best part was watching the little old grandmother cook the corn tortillas right in front of us. After taking a bite out of my first homemade tortilla, I knew I could never buy them from the store again and went out and bought a tortillas press the very next day. Tortillas are actually incredibly easy, though a little more time consuming, to make and so worth it for the extra taste. 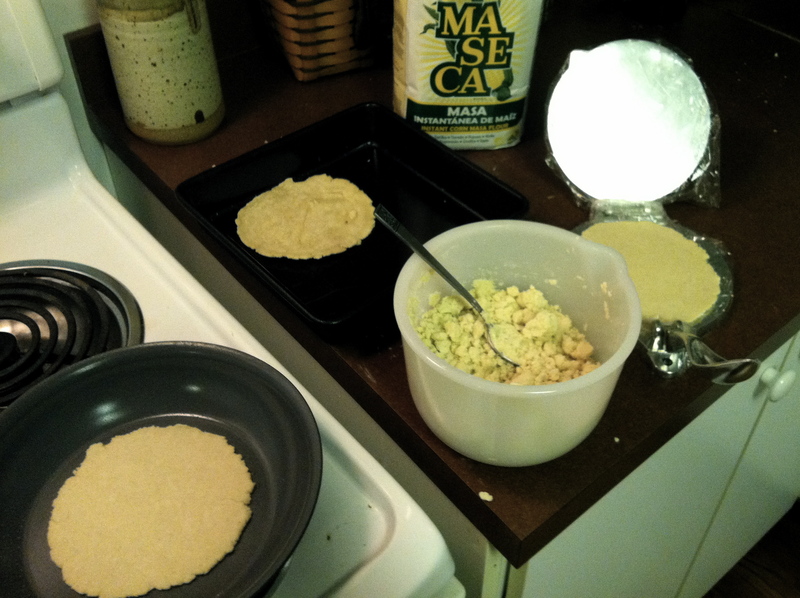 Just get a bag of masa corn flour (I use Masca) from the Mexican section of any grocery story and follow the directions on the back to make tortillas. 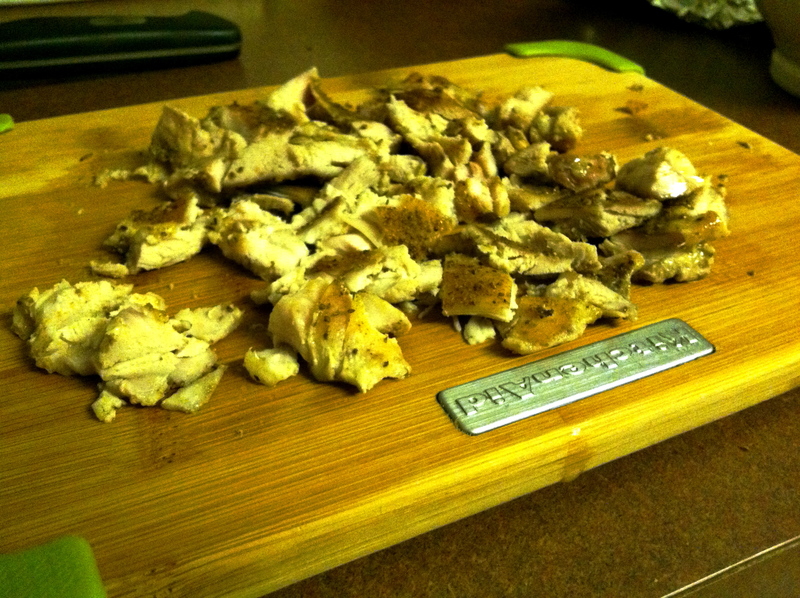 You can even fashion a makeshift press out of a cutting board and pie dish or rolling pin. Don’t be afraid to try! Now I call these my lazy enchiladas (despite the extra effort for the homemade tortillas) because I assemble them in what I have been told is the Spanish style where, instead of filling each tortilla individually, you spread the enchilada sauce between layers of tortilla in a way very similar to lasagna. I put four tortillas in the bottom of a 9×9 baking dish, spread half the cooked sauce over them, and repeated the process. I laid the third and final layer of tortillas on top and then poured the plain enchilada sauce I had saved earlier over them, topping everything with the remaining cheese. Then bake for 10 minutes at 375 and broil for another 5 or so minutes to turn the cheese on top a nice golden brown. The assembled dish ready for the oven. You don’t have to go out to a restaurant to enjoy delicious Mexican food. Enjoy! 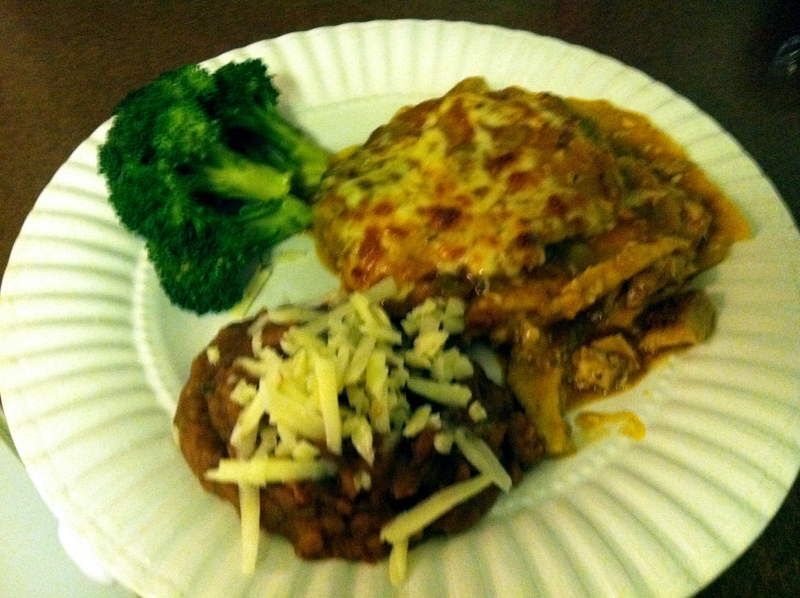 The final product served with refried beans and broccoli.